Is FEMA privy to some information that the New Madrid and associated fault lines are about to snap? For some reason, regularly scheduled re-training of the civilian corp was moved up two years, from June 2018 to June 2016. Per the Zetas, only the restless New Madrid would account for this. We received reports last week of various employees, citizens and etc. heading down to Atlanta Georgia to either the CDC (Center for Disease Control) and the Center for Community Preparedness (FEMA). Federal Emergency Management Agency is actually activating its Civilian Corps. This is primarily a group of current and former government and military people, many with various training backgrounds to broad to cover here. While this group is unarmed, they are generally drafted from the fighting branches of the US Military, medical and communications. We were informed that several companies in Minnesota responded large numbers of their own veterans heading south. 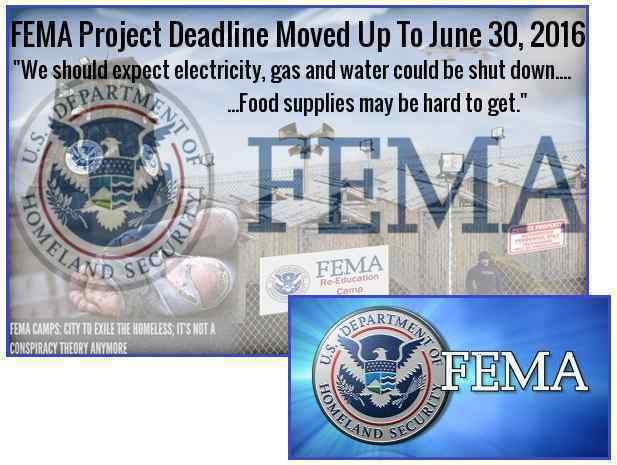 2018 FEMA Project Deadline Moved up to June 30th, 2016 - Why? It appears that FEMA is activating their highly secretive 'civilian corps' in the Atlanta, Georgia area. We should expect electricity, gas and water could be shut down. Food supplies will be hard to get. What this exactly is, we don't know but we know that things are happening very, very quickly in the United States. It was set for June 30th 2018 but it is now set for June 30th 2016. ZetaTalk Insight 6/18/2016: What would cause Homeland Security to move the planned re-education of their civilian corps from 2018 to this month, June of 2016? This is less than a month’s notice for these retired individuals, and bespeaks a sense of urgency. It would not be the hurricane season, which has been modest and is a known entity. It is not terrorism threats, which would be handled by the local police or National Guard or the US Military. It is not a pandemic, as even the Ebola crisis a couple years ago did not involve FEMA. It is obviously a pending New Madrid crisis of an immense magnitude. And where is this re-training to occur? In Atlanta, where FEMA Region 4 is centered. This region also happens to be centered between the New Madrid Fault Line and the East Coast Fault Line that activates when the New Madrid rips. In 1811 when the New Madrid last erupted, church bells in Boston rang due to participation by the East Coast Fault Line. FEMA Region IV serves the southeastern states of Alabama, Florida, Georgia, Kentucky, Mississippi, North Carolina, South Carolina and Tennessee. 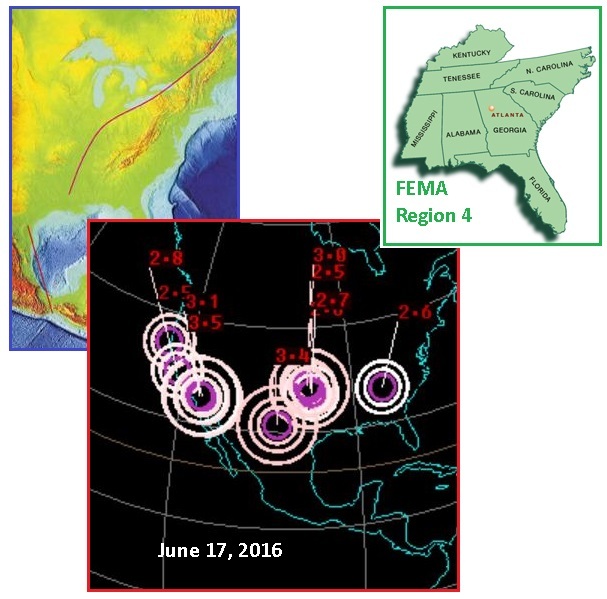 The Regional Office is located in Atlanta, Ga.
ZetaTalk Insight 6/18/2016: Centered in the Southeast between the course of the Mississippi River and the East Coast, training in FEMA’s Region 4 is positioned between the fault lines expected to rupture when the New Madrid goes. 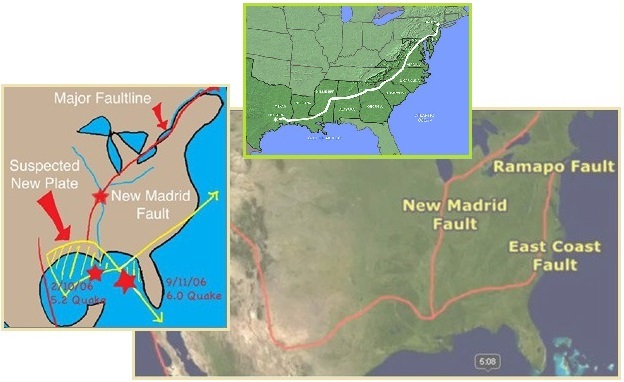 The New Madrid fault line runs up the Mississippi all the way to Chicago, and the East Coast Fault Line runs from Alabama through upper Florida and thence up the East Coast to Boston. Has Homeland Security received information that the New Madrid is ready to rupture? The bow stress in the N American continent is palpable, and there is ample geological evidence available to federal agencies. Earthquakes have picked up on the N American continent, which his normally quiescent as it cannot move, being a flat top prevented from rolling. The only motion it can tolerate is along the restless West Coast, along the San Andreas. And quake swarms have been ongoing in Oklahoma for over a year. But the devastation predicted by the Zetas is to relieve the diagonal pull through the center of the continent, and this requires the New Madrid to rip. When this fault line goes, it will not be inch by inch, as the diagonal adjustment must rip a huge area. It is thus held rigid, while stressed. Earthquake maps of quake swarms and minor adjustments do not foretell this event. But Electro-Magnetic-Pulse does show the degree of rock stress. Certainly Electro-Magnetic-Pulse affecting small planes has shown up for the regions that would be affected by a New Madrid rupture. As detailed recently in Issue 508 of this newsletter just last week, the entire East Coast of the US, at the heart of the bow stress that pulls the Aleutian Islands and the tip of Mexico together, was affected by small plane crashes the first week of June, 2016, from June 8-13. And it seems it affected Houston too, during that week in June, per this report on the massive electrical outage and strange sounds from the ground in Houston on June 12. This incident happened this past Sunday, June 12. I was walking my dogs at 5:45 pm when I heard a noise from the earth. I am 54 and I have never been witness to the likes of this sound and I would not have heard it this time had I been indoors. You know how a pot-lid will reverberate and spin like a top when placed rim-down on a table? That is what the noise sounded like but on a gigantic scale with snapping sounds thrown in the mix too. I swear I heard rock fingers giving way - three times. All three times were in the same general area but different precise locations - it kinda jumped around the neighborhood. Each incident lasted for at least 15 seconds and the sound filled the atmosphere like the trumpeting sounds except these sounds did not come from the skies. Two other friends heard a different sound about 20 minutes before the snap and crackle I heard. They both said it sounded like a transformer but not the humming, vibrating, electrical transformer sound. They couldn't describe exactly how it was different - just that it wasn't the usual electric hum. The power went during the course of this so my neighbor reported the outage through the internet on his phone. Reliant/Centerpoint indicated that power will not return until 8 pm. They also give no reason or speculation or explanation of the cause. The map of the outage area was a "significant" portion of Harris county. Local nightly news did not cover the outage either. This is strange because I live in the extreme southern portion of the county - 25 miles SE of Houston proper. I chatted with a lady and she said her brother lost power too. They were both puzzled by the absence of media attention. I don't know the distance from my house to his house as the crow flies, but via interstate he lives at least 30 miles north and west of me. An outage in only 10% of Harris county would affect at least half a million people! From what my neighbor said about the map, the outage covered more than 10% of the county. Sounds newsworthy to me. Why would this outage be suppressed in the media? In this way, each citizen assumes the outage only affected his immediate area, and the size of the outage is not realized. Panic in the people is feared. In truth, what would the establishment say? The entire region east of the Mississippi River and up and down the Mississippi River is not structurally ready for earthquakes. Japan and the West Coast of the US think in terms of quake-proofing their structures, but the East Coast is toast, so many old brick buildings, and will shatter and fall down. What is the establishment to say? “We don’t know when this might hit, but sleep outdoors until it does”? Earthquakes give little warning, though the Electro-Magnetic screech from the rock is a proven quake predictor. If pets leave home, and there is static on the radio – beware! ZetaTalk Insight 6/18/2016: As we have stated, the stress on the N American continent will be relieved by the New Madrid rip, not by any other adjustment. The N American continent does not have numerous internal fault lines that can relieve the stress, nor can the continent roll due to its flat top. What other emergency that FEMA might be called to address would paint the scenario that “electricity, gas and water could be shut down. Food supplies will be hard to get.” This sudden re-education of the civilian corp may or may not get into the major news outlets, or may be deemed too alarming and suppressed to avoid sparking panic in the public. Alternatively, the US government may choose to share the evidence they have been collecting, showing for instance an extreme uptick in EMP activity, particularly in the Southeast US. Another sign of distress in the N American continent is along the St. Lawrence Seaway, which is pulling apart as the bow tightens. Along the length of the St. Lawrence, there have been signs – booms down through Wisconsin, a crevasse on the Michigan Peninsula, and a persistent hum near Detroit. Lately, that Windsor hum is back with a vengeance. Per the Zetas, during the Last Weeks, when rock stress will be everywhere in the days leading up to the Pole Shift, this moaning Earth will be a big problem. The pulses, pounding and vibrations were some of the worst in years. For years residents in west Windsor and nearby parts of Essex County have been complaining about a mysterious hum like a refrigerator truck running. In March there were more complaints. A mysterious sound invades the shores of a large post-industrial city. It’s known as The Hum. Picture frames rattle on the walls; residents report nausea and lost sleep. Over the years, the sound comes and goes, but never stays gone for long. Half a decade after The Hum first sounded, it grows louder than ever. The Windsor Hum, as it’s known, has been compared to an idling diesel truck, a “constant earthquake,” an orchestra tuning up, and a car’s subwoofer playing Barry White. Gary Grosse, the Hum’s foremost expert and leading spokesman for its “victims,” said the sound comprises two main parts: a rumble and a pulse, both at an extremely low frequency. ZetaTalk Analysis 8/20/2011: The Seaway is ripping open but until the real drama ensues during the hour of the pole shift, there will be much stress on the rock, pulling apart. A hum has been reported in July, 2011 in Roseville, near Lake St. Clair, which is in the same vicinity as Windsor. Hums have been reported on the border between Wisconsin and the Michigan peninsula, where a large and growing crack appeared in October, 2010. The hum has been around in many places around the globe for years, but hums are on the increase due to the Earth wobble increasing in violence and the plate movements which has begun during the 7 of 10 scenarios. That the Windsor hum occurs at a specific time of the night, between 1-3 am, is a clue that this hum is a result of stress caused by the daily wobble! ZetaTalk Prediction 12/7/2002: The moaning of the Earth is akin to material snapping, screeching rock strata pulling across other strata, and vibrations of rock strata under tension. Many sensitive people report becoming ill prior to earthquakes due to similar vibrations, not particularly heard, but felt by the body in any case. Articles about the potential devastation in the New Madrid region have begun appearing in the media. The public is being warned! The 150-mile long New Madrid Seismic Zone in New Madrid, Missouri, is the source of the concern, and is also thought to be overdue for a massive tremor, which would impact seven states - Illinois, Indiana, Missouri, Arkansas, Kentucky, Tennessee and Mississippi. It has not seen significant earthquakes for more than 200 years. 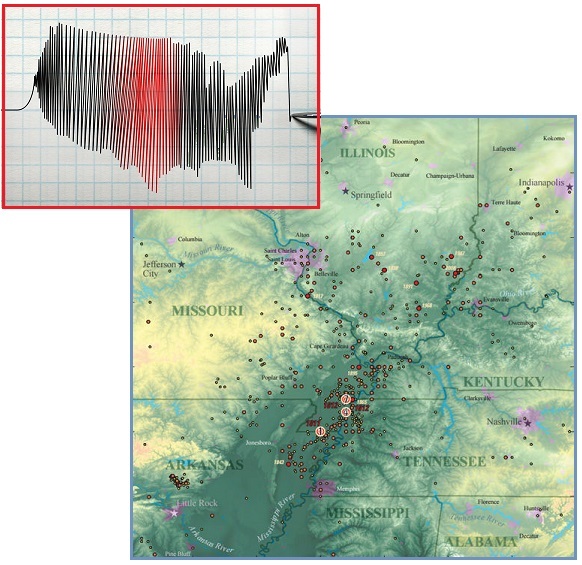 In the winter of 1811 and 1812 there were three earthquakes of magnitude 7 - as high as 7.7 - and a series of aftershocks across the American Midwest. The results were catastrophic, with the course of the Mississippi being diverted, chasms ripping open, and volcanoes of sand and water bursting through the ground. The Zetas have warned that as the Earth changes progress and restrict the distribution of goods, and as crop shortages result in food shortages, that starvation and rioting will result. Particularly in areas where the expectation that social services are in place and will provide for those dependent on these services. When this safety net fails, angry demands result. ZetaTalk Prediction 12/15/1995: After the cataclysms the snug blanket of protection that many have taken for granted will be gone - no Social Security checks, no home deliveries, no 911 emergency service, no free medical services, and no welfare checks. For those not relying on those services the shock will be as great, as with home, job, and service providers gone they will be just as destitute and bereft. In essence, humans will be relying on one another, and not on an infrastructure. What will this mean? This is almost always particular to cities, as it is in rural areas where the population can resort to gardening or gathering food from nature. But unless urban gardens have been instituted by wise government administrators, disaster awaits. There is also the expectation of the citizens, who in many cases are lulled into the expectation that social services will not cease. 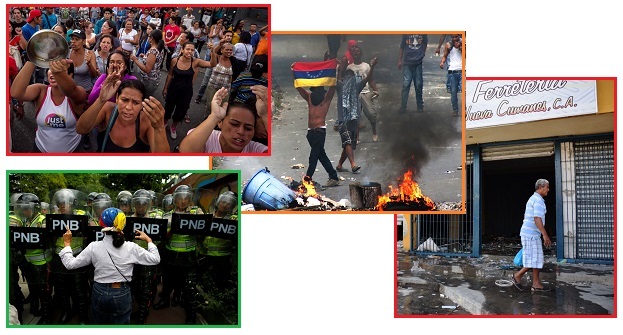 Case in point – Venezuela. Mired in economic crisis, Venezuela must import the bulk of its food items, but supplies have run short because of the government’s cash shortage, triggered by falling oil prices. Police arrested hundreds of people in the latest unrest, which heightened hardship and political uncertainty in the impoverished oil-producing nation. The army was sent in to keep order. The opposition blames Maduro for an economic crisis in which Venezuelans are suffering shortages of basic foods and goods. Maduro blames an "economic war" allegedly waged against his leftist government by the business elite. In reality, Venezuelan children have missed an average of 40 percent of class time, a parent group estimates, as a third of teachers skip work on any given day to wait in food lines. So many students have fainted from hunger that administrators told parents to keep their children home if they have no food. And while the school locks its gate each morning, armed robbers, often teens themselves, still manage to break in and stick up kids between classes. Yes, Venezuela had US corporate interests in control of its oil fields until Hugo Chavez was elected and kicked them out. Yes, the US corporate interests did everything in their power, particularly during the Bush years, to make Chavez fail. But the current crisis cannot be simply blamed on opposition. Chavez died of cancer, and his replacement did not, apparently, have management skills. Venezuela is in a temperate climate, ample water and good soil and a healthy populace. Its utter disarray is more a result of a failure in government. Ah, Hugo, Venezuela misses you! Hugo Chávez served as the 64th President of Venezuela from 1999 to 2013. Suffering a return of the cancer originally diagnosed in June 2011, Chávez died in Caracas on 5 March 2013 at the age of 58. Following the adoption of a new constitution in 1999, Chávez focused on enacting social reforms as part of the Bolivarian Revolution, which is a type of socialist revolution. 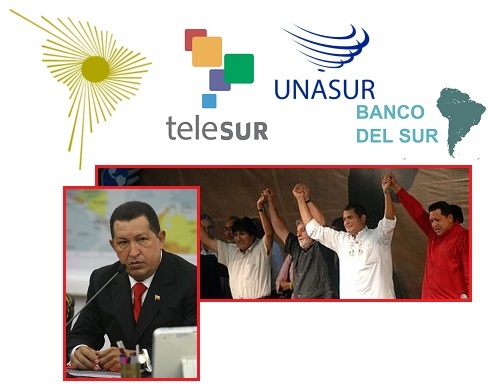 Using record-high oil revenues of the 2000s, his government nationalized key industries, created participatory democratic Communal Councils, and implemented social programs known as the Bolivarian Missions to expand access to food, housing, healthcare, and education. ZetaTalk Prediction 2/16/2001: In countries where social services exist, those desperate for a rescue will begin to assume that the government will act, perhaps at the last minute but in time to rescue them. Announcements will be made to peacefully evacuate cities and coastlines, tents will be erected, and the populace resettled after it is all over with the worst of it the beans and rice endlessly served for supper. The military, politicians, and those holding stakes in the cities and coastlines being deserted will put selfish interests aside and become humanitarians, in the end. For those clinging to this hope for rescue, we would only point out that the governments today do not act in this manner, but leave many starving children and injustices in their wake, daily. Stressful times will not create heroes, it will create slamming doors. 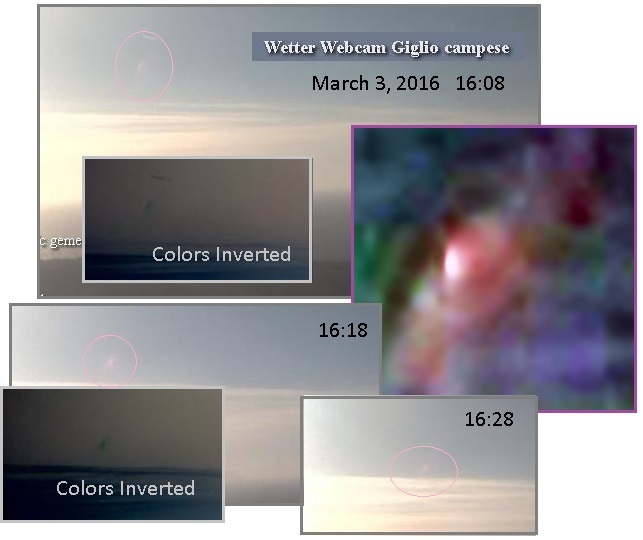 At the right time of day, and at the right angle, Nibiru can be seen in cams. This is the case for a couple cams in Europe, who catch Nibiru daily as the Sun sets. On occasion, a cam elsewhere allows a similar capture. The shape and pink appearance of Nibiru, with its football shoulder pads on either side where the dominant Moon Swirls ride, is well known. 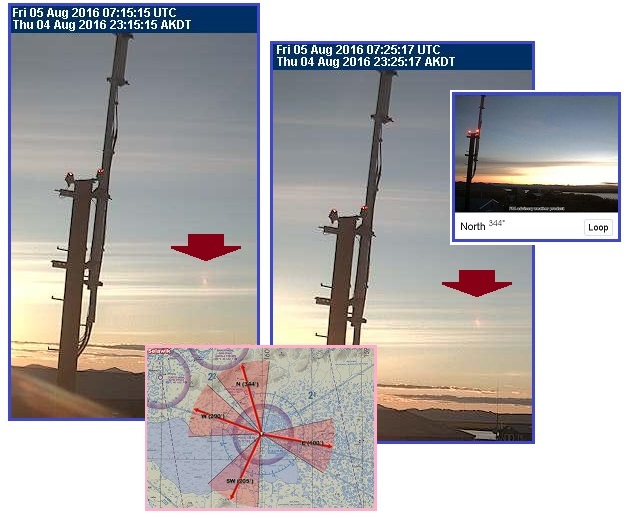 So it should be no surprise when Nibiru showed up in in a cam in Selawik, Alaska. This was not at sunrise or sunset for this location, but in the two hours just after midnight. The Sun peeked over the horizon at midnight, just to the West of North, for a couple hours because an unusually severe wobble pushed the globe into position. Due to the Earth wobble, at midnight for Alaska, the globe is tilted so the Sun comes up too far to the NE over Europe rather than East as expected. On the other side of the globe, in Alaska, the Sun at this time is visible when it should be just below the horizon. Then, in the video capture of this event, the Sun goes below the horizon, because the Figure 8 Earth wobble is correcting the tilt and the N Pole is being pushed away from the Sun during the Polar Push. This was a lucky catch for this cam, and proves both that Nibiru and the Earth wobble exist. The Alaska cam in question is a weather cam for pilots, run by the FAA. This is not a flare. I found clear evidence of Nibiru in the Alaskan skies! Please note, I went back 6 hours later and the sky was clear. I kept checking for a further hour and the sky was clear – so no, this was not lens flare or any other camera anomaly. Located in Selawik, Alaska, there are 4 cams pointing in different directions. This cam is clearly the cam pointing NNW to 344° degrees. 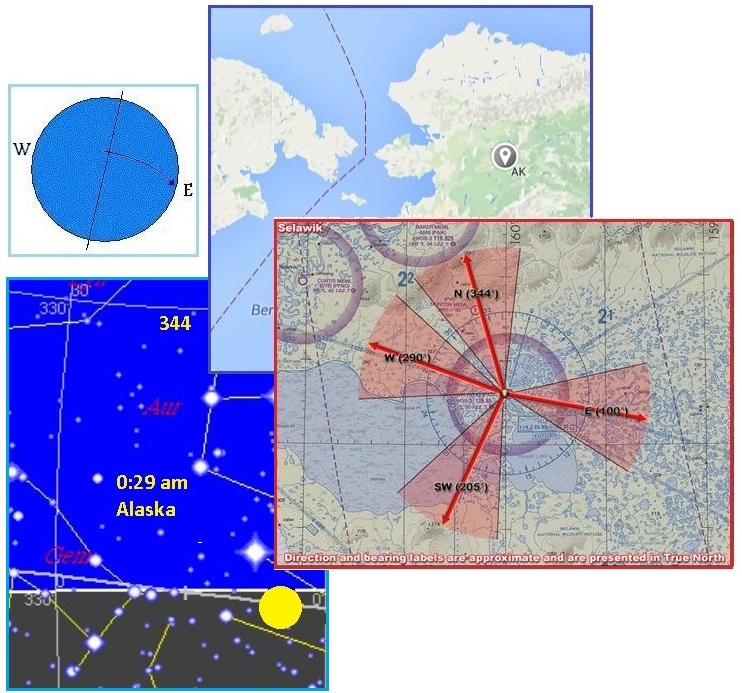 When the Sun comes up at midnight Alaska time it is within the 344° centered view, close to North at 360°.